This blog has been quiet for a little while... Partly (among other things) because I've been too busy spinning to write anything. And the reason for that is that I am the proud new owner of a secondhand Haldane Orkney. The Orkney is a compact little upright wheel made by the Haldane company in Scotland. Haldane don't make wheels anymore - they stopped in the late 1990s - but their wheels seem to have a good reputation. I like that this wheel has some history behind it - I know that it's belonged to at least two other spinners before me. I can't find any good resources on dating the wheels, but it's possible this wheel is older than I am. Even so, it's in excellent nick - being supplied with 6 bobbins and all the necessary parts. 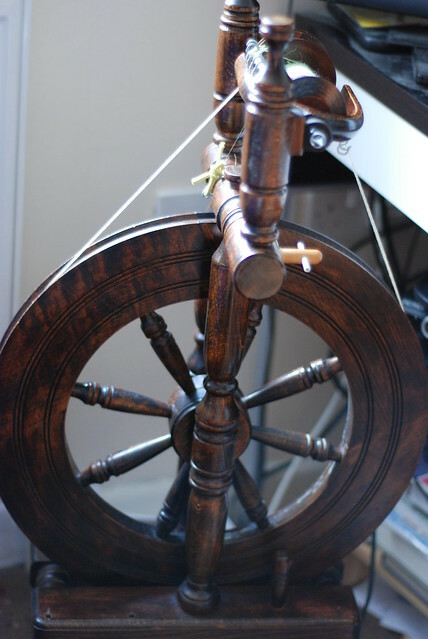 The only thing I had to do to get the wheel spinning was find a bit of elastic for the scotch tension (even that wasn't strictly necessary, as I could have set it up double drive - but I am really enjoying spinning with scotch tension). Besides the wheel itself, the seller also included a few bags of fiber and a set of hand cards in the sale. The hand cards are great - I'd only had a mini set of carders before, so it is a bit of a learning curve learning to use the full-size ones. But the rolags I make last for ages! The two bags of fiber were a bag of raw mystery fleece, and some dyed merino top. I haven't gotten into the fleece yet, but I've gone through the top already between carding practice and wheel practice. I felt the same way when I first started on the wheel. Lovely color to that wood! What a beautiful wheel! I hope it gives you many years of yarn-making enjoyment.